Do You Really Need the A/C? It’s warming up in many parts of North America, and as consumers stare down an already oppressive electric bill, they may be wondering if air-conditioning can fit into the budget. Whether you’re hoping to save a little on your current A/C bill or you are open to getting rid of it altogether, there are some tips and tricks for being a little less dependent on modern cooling systems. Yes, you may want to feel comfortable. But do you have to have your air on for survival? For some people, an air-conditioning solution is necessary to control the humidity in their home and create a tolerable environment. Older people can overheat more easily, and those with asthma may find that cooler air helps with their breathing. It is important to note, however, that a poorly-maintained unit can actually aggravate certain health conditions. Mold, dirt, and dust can build up in cooling systems, causing more harm than good. If you decide that A/C is something you can’t live without, make sure to have your cooling systems serviced and cleaned frequently. Not having a cool home may have a cost, as well. Guests not wanting to visit because they think your home is too stuffy, mold growth, or health deterioration due to sleepless nights are all expensive – if not calculated in a “budget” cost. It’s important to weigh the benefits against the true costs to determine a value that goes beyond your electric bill. Opening windows on cool nights when the humidity is lower outside than inside. Before the sun comes up the next day (or shortly after), shut them again. Use heavy curtains (often called black-out curtains) on all windows during the day. If you find these to be expensive, try quilts or thick blankets that you may have on hand. Keep air circulating throughout the home with fans. (Ceiling fans should turn counter-clockwise.) Always turn on ventilation fans above the stove and in the bathroom when in use. Don’t use appliances that “heat up” your home. Try BBQing outside or using a crockpot rather than using the oven. Set up a line to dry your clothes outside, instead of drying with a clothes dryer. Close up rooms that you aren’t using and cool the rest, if you like. 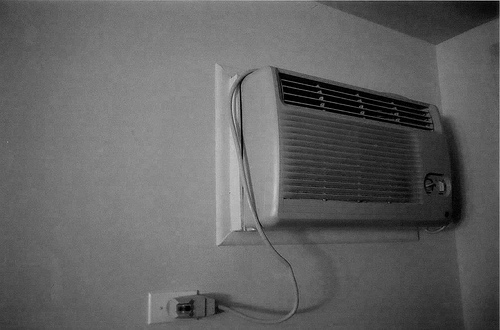 I use a portable A/C unit on the hottest nights in the bedroom only with the door shut. There’s no need to cool the whole house! There are many alternatives to a traditional whole-house unit, including a heat pump or, in some arid areas, a swamp cooler. Be sure to consult an energy professional before upgrading or replacing expensive equipment. You might find that you can get by with what you have by modifying your use slightly. Do you plan on running your A/C this summer? What tips do you have for reducing cost? We live in a townhome, so don’t get good air flow through since windows are only on one side. The humidity here in NJ gets so bad that we can get mildew in the basement and the wood floors can buckle. The main job of the a/c is to remove the humidity. While we’re away during the day, we have our automatic thermostat set to raise the temperature, so the a/c doesn’t kick on, but humidity is controlled. That way we minimize our costs. We also kick up our ceiling fans so the a/c doesn’t have to work so hard. Fortunately, the super hot, humid weather is only for about 8-10 weeks of the season. Great post and great tips. We follow a lot of these already but we still install our air conditioner as a back up. We also find using a crock pot works well for keeping the heat down in the house. I agree that it’s nice to have a backup A/C, even if you don’t plan on using it. We have had family stay with us and were glad we could turn it on for them. Also, I don’t subscribe to the “all or nothing” belief that many frugal bloggers are pushing these days. It’s a personal choice, and I don’t think that there’s much to be gained by challenging people to keep it completely on or off. We use a smidge when we need it and leave it off when we don’t. Thanks for your tips! I live in Atlanta, GA, where temperatures in May have already reached 90 degrees with lots of humidity … and we DON’T run the A/C. We keep our windows open, our ceiling fans on, we have awnings that block direct sunlight from coming into the house, and we drink lots of water. It’s better for our wallets AND for our health. I need to “on” the air con, but I keep it low to the minimum and “off” it during the night. Taking showers before sleeping can be a good habit at this time.